Cutting Corners is not a fad or a gimmick. It is a lifestyle. And I am not a dietitian or exercise physiologist: I am a former obese, chain-smoking regular guy who has suffered from anorexia and other unhealthy habits. Through years of trial and error, I believe I've developed the definitive guide to sneaking exercise into your everyday life. I also offer some nutritional advice, but it is always recommended that you consult your physician before modifying your diet and beginning any exercise program. As humans, it is in our DNA to eat as much as we can, when we can, because at our core, we are still scavengers. In our modern fast paced world, however, food is only a phone call away. Weight Management is not as hard as you may think and with my exercises and guidelines, you will soon see that weight management can be simple. 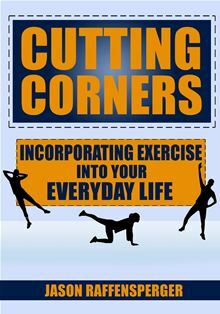 Cutting Corners gives you the exercises and guidelines you will use in your day-to-day life to help you get in shape and stay in shape. You may never need to set food in a gym again as the Cutting Corners exercises can be done any time and anywhere. Each one takes less than 60 seconds. "The more you read, the more things you will know. The more that you learn, the more places you'll go." "Read the best books first, or you may not have a chance to read them all."